I live with the world’s biggest cheese fan, so I always have cheese in the fridge and I know making a cheese ball is never a bad idea. Now I realize everyone may not like cheese as much as my husband, but I think cheese balls are a great, versatile appetizer that everyone should know how to make. They come with endless options and allow you to create a new variation every time. 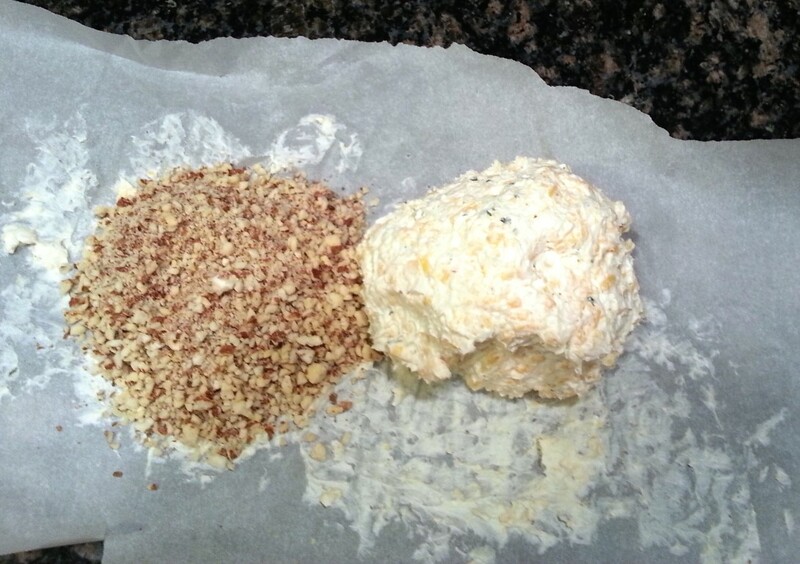 Start with a package of cream cheese, add in seasonings, shredded cheese and roll it in nuts and voila – you have a cheese ball! 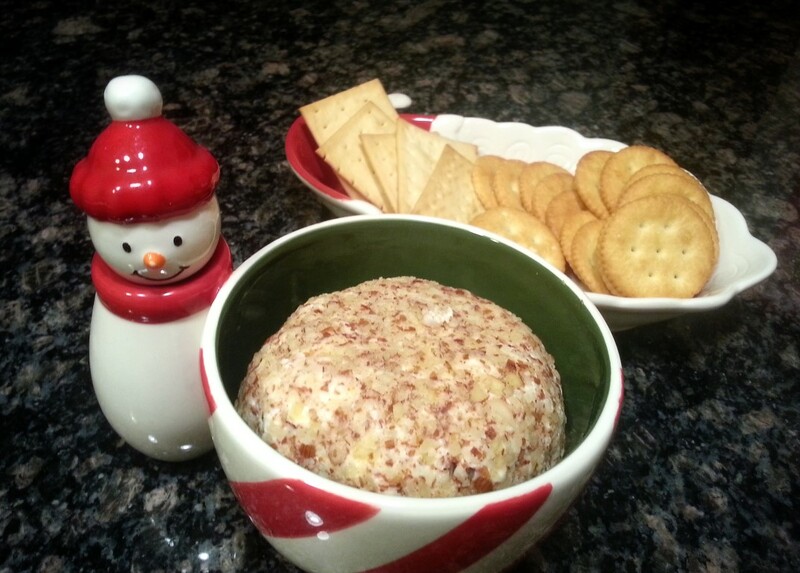 This particular cheese ball recipe comes from my dad (with a slight modification from me). He’s the go-to cheese ball maker in my family and makes them every year around Christmas time. His recipe uses ranch seasoning that provides a great salty balance to the savory, creamy cheese. 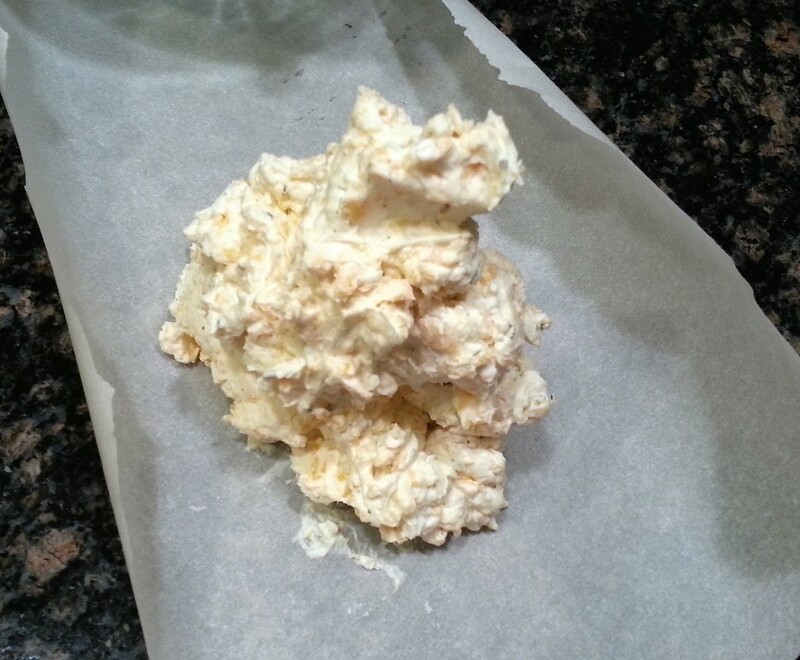 Before you begin, let a package of cream cheese sit at room temperature for 15-20 minutes. This will allow it to soften and will be easier to mix. 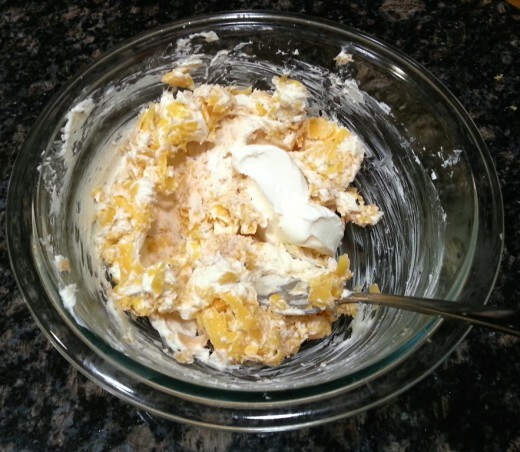 In a small bowl, mix cream cheese with 2 tablespoons of sour cream and 1/2 of a packet of Ranch seasoning until well combined. Add in 1 cup of shredded cheddar cheese and 1 teaspoon each of minced garlic and dried minced onions. Mix well. Lay out a piece of parchment paper and transfer the cheese mixture onto it. 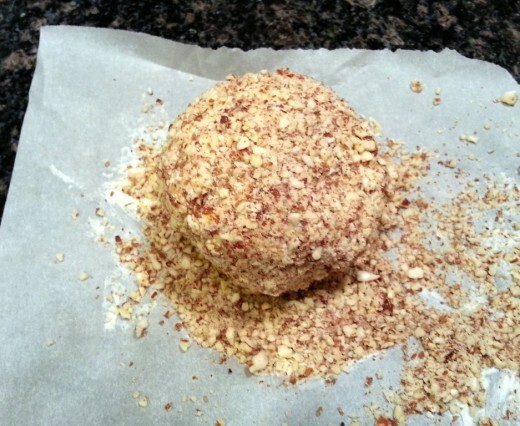 Use the parchment paper to gently shape the cheese into a ball. It doesn’t need to be perfect; once you roll it in the nuts, it’ll be easier to form. Pour about 3/4 cup of chopped almonds (I used whole and ran them through my food processor) onto the paper. Roll the cheese mixture in the almonds until well coated. Transfer the almond coated cheese to plastic wrap and enclose. Now is a great time to shape the ball as you please. Place in the refrigerator for about an hour to let the cheese firm up and set. 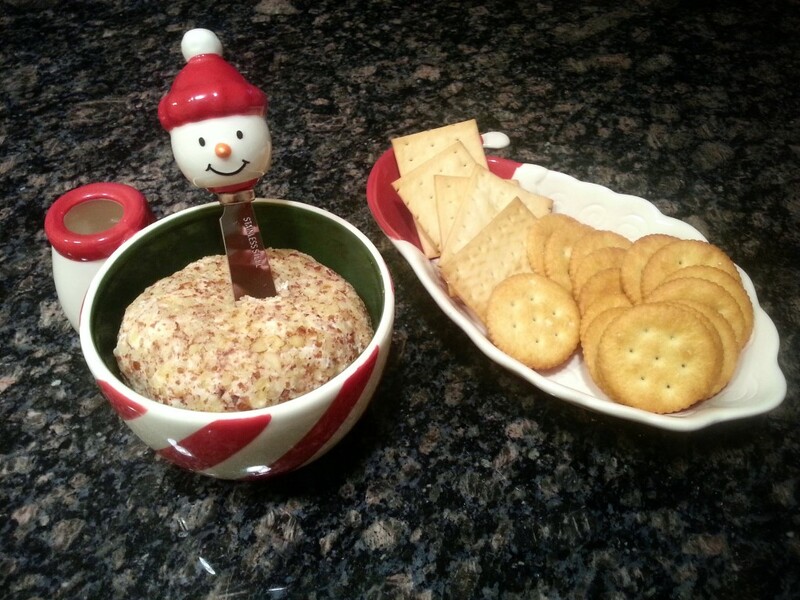 I served my cheese ball in this really cute Christmas set from my mother-in-law and set out a variety of crackers to go with the cheese. It also came with a small cheese knife that worked perfectly for spreading the cheese onto crackers. 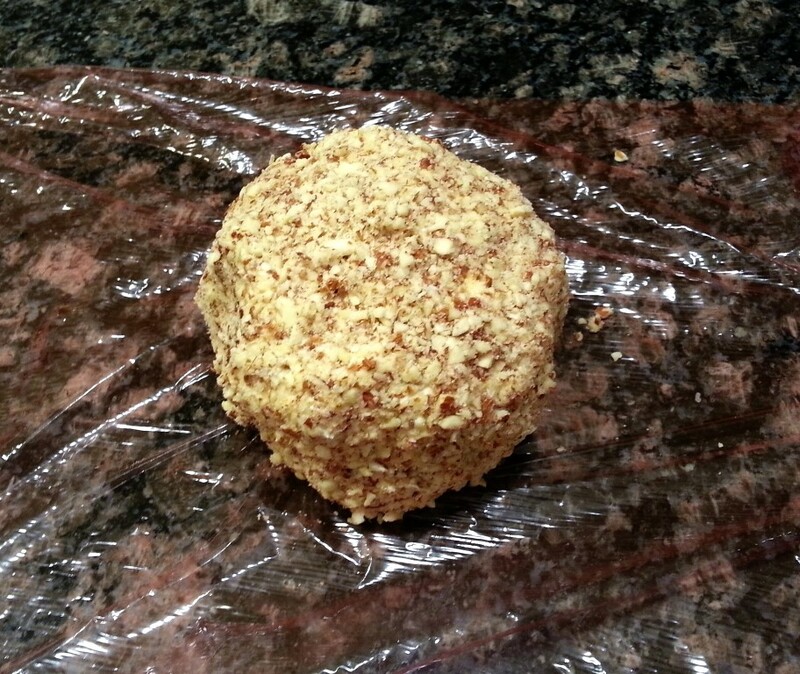 If you don’t have a cheese ball set, serve the cheese ball on a small plate and set out a small knife for spreading. Regardless of how you serve it, your guests will love this cheese ball! 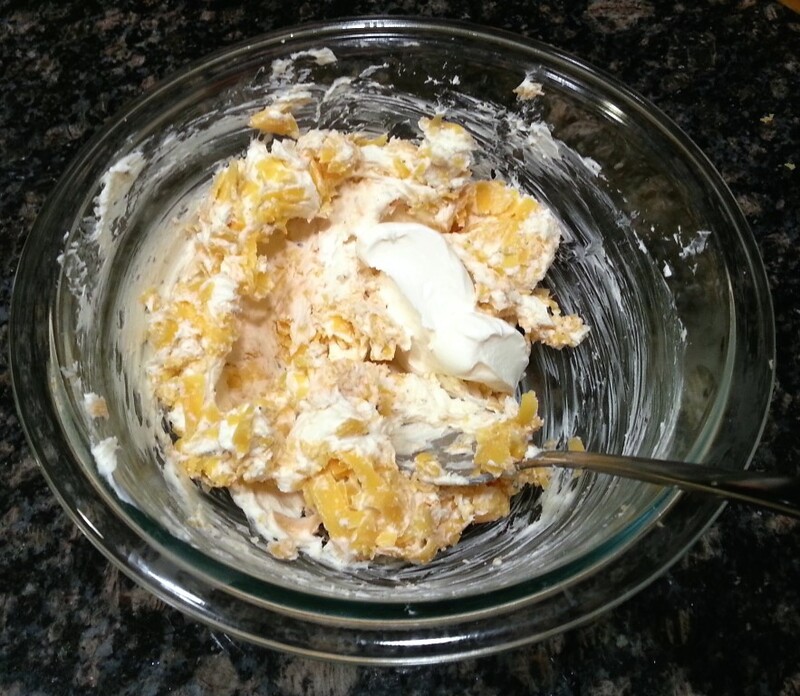 Combine cream cheese, sour cream and ranch seasoning until smooth. Add in shredded cheese, minced garlic and onion. Mix well. Transfer to parchment paper and roughly shape into a ball. Pour almonds onto parchment paper and roll cheese ball in it until well coated. Transfer to plastic wrap and enclose. Shape into a more rounded ball.